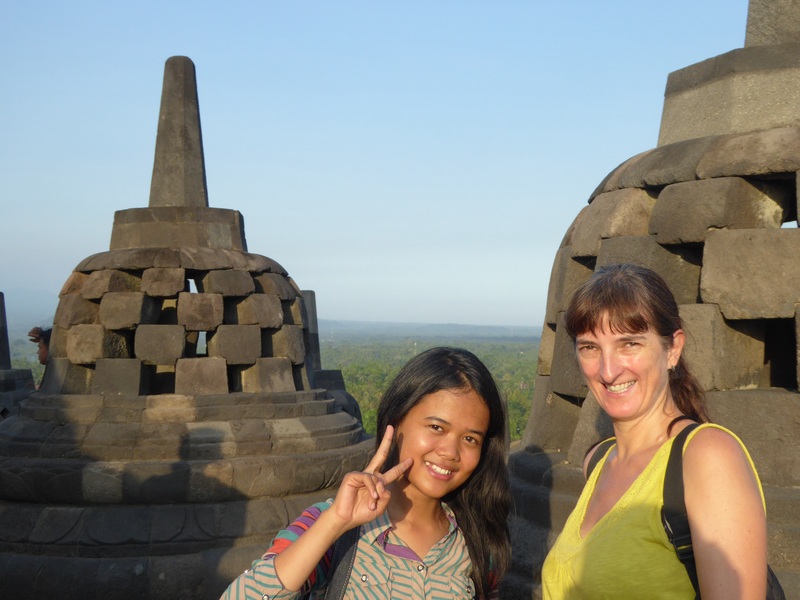 Borobudur is,quite simply, breathtaking if a lot smaller than we had envisaged. The Borobudur Temple is a 9th century Buddhist temple, built entirely from stone. The design blends Indonesian culture and ancestor worship with the Buddhist concept of attaining nirvana. The lower 6 levels are square, topped by three circular levels upon which is a dome. The first level to walk around is square and each of the four sides is 387feet/118m long. It is a tough walk directly to the top using the steep stone steps, so walking around 0.5km on each tier gives us time to catch our breath and look at some of the carved stone relief panels and to see the views over the surrounds countryside. The top few tiers are adorned with 502 Buddha statues, 72 of which are individually seated inside perforated stupas. Everyone with a camera is inspired to take the perfect photo and there are many, many, good shots to be had. We were staying one night at the Manohara hotel which is situated in the grounds of the Borobudur temple complex itself and provides all day access to the temple – or so we thought! Arriving late afternoon and hoping to see the sunset we climbed to the top of the temple and were rewarded with the most spectacular views of the surrounding volcanoes. Along with lots of other people we wandered around the various temple levels drinking in the views. We were approached by a young student who shyly asked if she and her friends could chat with us to practice their English. A delightful girl, she spoke excellent English and told us that all the English teachers in Indonesia tell their students to go out and find a tourist to practice on and they are given time off from lessons to do this. This was their prime town in the area for hunting tourists! This also explains why we keep getting stopped by students ! As sunset approached the crowds started to thin out which did seem a little strange. Fewer and fewer people are around and eventually the guard asks to see our tickets. It turns out that the tickets provided by the hotel do not cover sunsets! The guards tell us we must leave immediately saying that we didn’t have the right ticket for sunset. We just took our time leaving and managed to see the sunset anyway. We knew that we had to buy additional tickets for dawn at a cost of 220k rupiah. So it was an early start to buy our tickets from the hotel reception at 4.30 am. Getting up early has not been a problem here (as elsewhere!) because at 3.00am the muezzin are calling everyone to prayers over the ubiquitous P.A. systems! Torches in hand, we ascend once again to the toptier of the temple and bag our spot in prime position for the sunrise over the volcano. Before long we were surrounded by Chinese tourists, some of whom seemed a little jealous of our prime position. One or two did try to encroach but we managed to defend our territory successfully (if only we could have held onto Hong Kong!). The effort of getting to the top early was well worth it as the sunrise was spectacular. Although it was touch and go at times as the clouds refused to budge from the twin peaks of the volcanoes until the final moments before dawn. As sunrises in exotic parts of the world go, this was one of the better ones. The only slight negative was the fact that, despite being the most sacred Buddhist site in Indonesia the whole complex is surrounded by loudspeakers and in the hours around sunrise the muslim muezzin seemed to be competing to see who could wail the loudest which did detract from the experience somewhat! Dawn entrance tickets to the temple complex are only available from the hotel and numbers are limited to 100. I would guest 50-60 were there with us. Without a doubt, this the best time to visit and well worth the entrance fee and early start. We spent a couple more nights in Borobudur at Cempaka Villas, a nice place with decent rooms laid out around a central courtyard. It was new. The friendly staff did their best but were pretty hopeless. Breakfast was a shambles but they seemed great at arranging tours! Main problem is that it was smack bang in the middle of 4 mosques all competing for the loudest praying/singing/ music at 3,4 and 5 am. Given that we have yet to have a night in Java without being woken up at these hours, we are getting very sleep deprived! Borobudur is a nice town in which to spend a few days, we did a great bike trip out into the countryside, more of which will appear in another post soon. We got a taxi from Yogyakarta to Borobudur for 200k Rupiah and returned by local bus which was easy, quick, cheap and fun and 20k Rupiah. Even though the return journey involved a change of bus, the system in and around Yogyakarta seems remarkably efficient and easy to use. Next Post: Mount Bromo – In Search of Volcanoes. Lovely photos! I did Borobodur as a day trip from Yogyakarta, so no sunrise or sunset. On the other hand, I didn’t get woken up by the call to prayer. Glad you liked them Thursdaysd. Easy to take decent photos in such a place. The call to prayers is partly why we are now in New Zealand! Loved New Zealand! Fabulous scenery. Have fun. Did I gather you were in Indonesia for Ramadan? I always try to avoid Muslim countries then, worried about getting fed in the middle of the day if nothing else. Could also have something to do with horrible guide. Maybe he’s always horrible, but fasting can’t help. We were there over Ramadan – never again. The guide had no excuses though, he was Catholic!! The guide was a real loser then! Had one of those in Romania… I did spend one day in Istanbul during Ramadan on a layover on the way to Georgia. That was interesting – lots of places set up for feasting after sun down. But I skipped eastern Turkey, which I would have liked to see, and flew instead. Glad you like the photos Katye. Indonesia certainly makes it easy yo take decent photos..